The Brighton and Hove Archaeological Society considers outreach to the general public as part of its aims and objectives. The society would like to increase its membership and promote the archaeology of Brighton, Hove and the surrounding area. Members of the society frequently attend various venues to conduct excavations, geophysics or finds processing and these activities are usually part of a bigger event. In May members of the society were at Michelham Priory for their May celebrations and in June we joined Tristan Bareham and the ESAMP team for 3 days of finds processing at Moulescoomb School. At Moulsecoomb pupils from other schools were 'bussed in' to join other groups in enjoying and learning about various subjects including archaeology. The pupils were able to participate in excavation, finds processing and metal detecting. During July the society was at Brighton Museum on two days as part of the Festival of British Archaeology organised by the CBA. Here members continued their finds processing sessions, interacted with the general public, met foreign visitors, and recruited new members. A second visit to Michelham in July was also part of the Festival of British Archaeology. Our next venture will be on Whitehawk Hill on September 20th where the society will join other groups in a festival of archaeology and nature. The purpose of this event is to raise the profile of Whitehawk Hill and to attempt to protect and enhance the much neglected Neolithic causewayed enclosure located on the hill. It is important to raise the profile of the society and make people aware that they do have a very dynamic and versatile local group. It is also important to show them that they too can be part of that team, even without previous skill or experience as the society is willing and able to train people in all its activities. An archaeological evaluation excavation comprising five trenches was carried out on Ditchling Village Green to investigate the impact of a proposed new access scheme on archaeological deposits. Desk based research had shown the site was potentially the 'village farm' from the late Saxon period through to 1966, when most of the buildings were demolished to create the current village green. Two buildings were left extant, the cart lodge and elements of the great barn and the small barn. The excavation identified below ground remains of at least two buildings, a cobbled surface and a concrete surface/structure. Finds mainly comprised of post-medieval building material, pottery and metal artefacts relating to the farm complex, but also included residual material from the Mesolithic, Roman and medieval periods. The project was successful in establishing the presence, condition and depth of archaeological features and deposits in order to inform a redesign of the proposed path scheme to reduce impact on the historic environment. THREE WEEKS AT BARCOMBE: THE DEVELOPMENT OF A CBM 1 ANORAK? Last year I was asked by Chris Butler and David Rudling to be their Finds Supervisor for the 2009 season of excavations at Barcombe Roman Bath House. I wasn't naïve enough to expect the task to consist of washing and marking exotic Roman tableware, or packing exquisite metal work in acid free paper into a crystal box, but I was a little taken aback on my first morning to be presented with a huge array of piles of mortar and tile either loose on the ground or stacked by the hedge in plastic fertiliser sacks, some of which had been there so long that tiger slugs 2 had taken up residence and a variety of plants had taken root. Fortunately, for the first week I was accompanied by Dianne Butterfield, whose organisational skills are exceptional, and after she'd sorted me out, together we fell into a rhythm of sorting tiles and mortar. The more straightforward artefacts to look for were tegulae 3, imbrices4, box flues and flat tiles. What really surprised us was the number of slightly different shapes of the flanges of the tegulae. By the end of the three weeks there were 39 different flange shapes: still a long way to go in comparison with the 60 that were found at Piddington Roman Villa, but even so: each one had to be drawn and described. Was each shape an indication of a particular craftsman? Or was it simply because each tegula was hand made rather than machine made and therefore that variation was inevitable? We also had to make a note of the cutaways 5 which we sometimes found at the end of the tile. We found a number of imprints in the tile - mostly dog paws - but also shoe nails, and fingerprints of our ancestors. There were also many different patterns of combing on the box flues. The combing was in order for the mortar and cement to stick to bond with the tiles: hence it would never have been seen which made the number of different patterns all the more surprising. Sometimes the keying was done by means of a roller and David was very pleased when one day we found a piece of tile with an extremely elaborate rolled pattern of a type which had never before been found south of Lullingstone Roman Villa. We suggested a system of describing the fabric of the tiles: though I'm not exactly sure if it meets industry standard, since one of the fabrics was frequently described as 'manky' - orangey, crumbly and flaky. Otherwise known formally as 'Type 4. Similarly we developed a suggested typology for the mortar and cement which, according to the type, size and number of inclusions, came in a variety of colours and density ranging from dark pinky orange through to chalky white. We wondered about using a Munsell Chart 6 to describe them but decided against it since the colours seemed to change according to the weather. There is a lot to learn; we are only at the beginning of the process and I fear that a lot of evidence has been missed through ignorance. So if anyone has any ideas of places to visit or people to meet in order to further my knowledge, please get in touch. If anyone had told me at the beginning of July that I was going to find tiles and mortar interesting, I would have laughed at them and told them not to be silly. However, much to my surprise the season proved really fascinating and I began to feel I was reaching out to the everyday craftsmen (I'm making an assumption here which might not be justified!) of 2000 years ago in a way which is very different from the feeling when cleaning up a piece of Samian ware for example. To see an artisan's fingerprints, or the paw mark of his dog and the hobnails from his footware, and to put my own fingers in their marks, seems much more of a link with the past. To work with tile and mortar is truly to meet the ancestors. limax maximus - according to Wikipedia, one of the largest kinds of keeled air breathing land slug in the world. The earliest recorded spelling is Stretham, referring to a straet, i.e. a Roman road. Old English (OE) ham meant a village; but no village is known there. OE straet-ham is more likely. It may mean a river meadow, or dry ground in a marsh, by a river and on a Roman road. This is the Sussex Greensand Way (M140) which crossed the tidal Adur by ferry or ford. 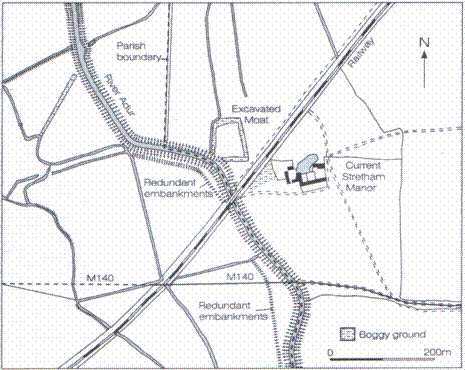 The excavated moat and the adjacent Stretham Manor, are respectively, in a river meadow, and on dry ground next to it, but they lie 300m upstream of the road. OE straet-ham may also mean a promontory of dry land into water. This is a precise description of the river crossing. I think the name first meant that, and was only translated to the manorial complex when that was first built. Since only the island was excavated, we don't know when it was first built. The name was probably only applied to the site excavated, after the embankment was built to protect it from tides. Later the river shifted and flooded that moat's island. The dig will be published in SAC. The main focus of the BHAS excavations for 2009 has been at Ovingdean. The BHAS field unit returned to the medieval manorial site in June to further investigate the medieval house partially uncovered in 2003 and 2008. The previous investigations had uncovered the south/west corner and north/east corner of the building and both were quite different. The south/west corner had shown walls over 1.4M thick and over a metre in depth. The north/east corner had been dramatically robbed of the large wide flint wall constructed of large flint nodules, grit and mortar and had later been replaced with a less substantial, but still well-constructed wall, measuring only 80cms in width. A small section cut through the interior of the house proved that it possessed a cellar or undercroft, with two sheep skeletons at the bottom. The small investigation of the south/west corner examined in 2008 had uncovered a later floor comprised of large beach pebbles lying over a compact rammed chalk floor. The upper fill of the interior of the cellar had been used as a rubbish tip from the Georgian period onwards, with coins of George II, George III and Victoria being found. This year, the site was divided into 2 metre squares and the finds collected from the top soil in these discrete areas. The archaeology is immediately below the turf which comes down onto a layer of contemporary roofing tile indicating the use of the field when re-roofing St.Wulfran's church. On the advice of the County Archaeologists sections of the site have been left for future archaeologists. This is to allow for later archaeologists to investigate and perhaps reappraise earlier efforts to better understand the complex features found within the building. The walls are gradually being uncovered and the complexity is clearly visible. The north wall, and part of the east wall were the subject of severe robbing. The whole area is covered with masses of flint nodules, grit and mortar. The thinner later wall is well constructed and part of a later phase of construction, as is the beach cobbled floor surface still being found in-situ in various locations over the interior. The west end of the building has a reduction in wall width at its north/west corner, a similar reduction is not evident, as yet, on the south/west corner. The link between the large east wall section and the later thinner wall has an intriguing ditch feature lying in the interior possessing some form of metal work, as yet still hidden. The walls appear to have been built first and then a variety of chalk and loamy fills poured into the construction ditches. A number of sherds of medieval pottery have been found in this outer layer, proving that the chalk revealed is a fill and probably part of an artificial platform on which the complex is built. The finds from the interior of the house have, other than recent roofing tile, been comparatively few. However, among the items have been a coin of Charles II and a number of pieces of dressed stone. Other finds have included a few pieces of green glazed medieval pottery, tile and oysters shells, as well as 'mother of pearl' items and clay pipe fragments. The Young Archaeologists Club (YAC) joined the BHAS field unit twice this year at Ovingdean, in June and July, and the field unit's excavations at Ovingdean will continue until late October. The new season of excavations at Rocky Clump began in April. A new area north of the existing 'bones trench' had been started during the autumn of 2008 and a number of late 3rd century coins had been uncovered. The coins were identified by Bill Santer as barbarous radiates. The general depth of soil over this part of Stanmer averages about 200mm but during the season of 2008 this depth had dropped to over a metre. The previous season had revealed an intriguing stratigraphy with a number of well defined layers clearly identified in the deeper south facing section. The area was divided into 2 metre square sections, to investigate the spatial deposition of artefacts and their possible movement over the frequently ploughed area, but which is now set down to grass. During the new season each layer was systematically removed and the finds collected from the various deposits. The layers consisted of a mixture of heavy clay soils and chalky loams, but well defined and separate. In one layer there were considerable numbers of land snails clearly indicating a lapse of time between one deposition and another. The finds were not too numerous but did include a large piece of tegula Roman roofing tile. Other finds included pottery, shell and some prehistoric flint work. The lower layers in the section had shown large pieces of chalk and large flint nodules. As the excavation progressed to the lower depths, butchered animal bones were uncovered, in discrete areas, over what proved to be an in-situ flint cobbled floor. At the western end of the floor, which has a circular configuration, was found a large sarsen stone, still embedded in even lower layers. On the floor were found several interesting metal work items and a large section of glass from a Roman storage vessel. The metal work included a zoomorphic type brooch dated to about 280AD and a possible child's 'snake' finger ring from just below the large sarsen stone. The large ditch running south to north, and lying west of the floor, was also excavated. The finds from this 2 metre wide section included Samian pottery and lots of butchered bone including almost the whole carcass of a cow, the second from Rocky Clump. The flint cobbled floor exposed this season and the large amounts of butchered bone suggest that this could have been a Roman slaughter yard. What is clear is that the floor pre-dates the large north/south ditch as the upcast from this feature overlays the floor deposits. David Rudling visited the site in May and suggested that the circular end of the floor could possibly be a Roman well. There are a number of large ironstone pieces forming part of the circular section. The excavations will resume in the autumn when the BHAS field unit returns from Ovingdean. It is planned to extend the trench in both east and north directions to uncover the whole of the floor before cutting new sections to investigate the lower depths below the floor and find out if, indeed, Rocky Clump does have a Roman well.